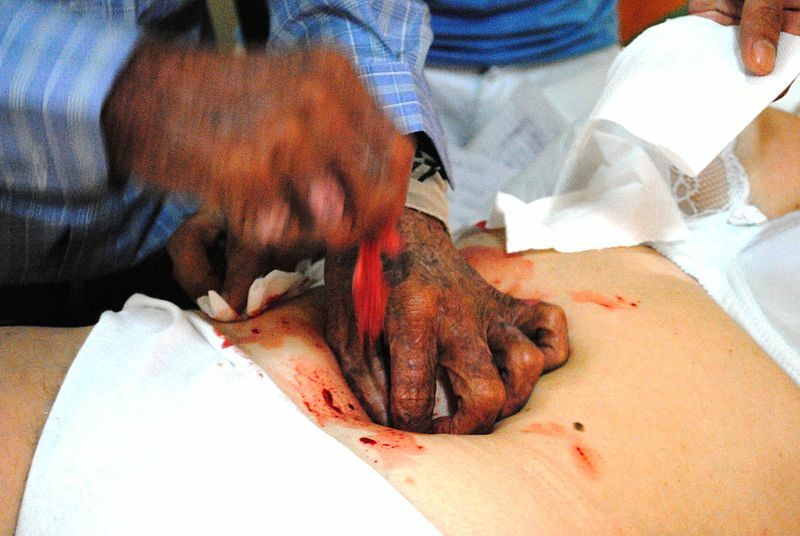 In the Philippines, psychic surgeons conduct surgery without any instruments and claim to cure patients. One such psychic surgeon came to India in the 1980s and the first surgery was conducted on a minister of Maharashtra State. The surgeon thus acquired much publicity in the news media. When he was confronted by skeptics, he had to leave India. Later, it was known that he fell sick and instead of going to another psychic surgeon, he got admitted into hospital for surgery. Many psychic surgeons and doctors have appeared in India due to television programmes on Yoga for health and on holistic cures. Satya Sai Baba has also conducted psychic surgery on the son of Dr. Bhagwantam, and others, but they dies of the same disease. Props: Blood in a plastic bag or thumb tip, part of an animal intestine, surgical cotton, and a table. Method: Call a volunteer and ask him to remove his shirt and vest and lie on the table. Ask him to close his eyes and go to sleep. Have some blood hidden in the thumb-tip or plastic bag in your right hand. Press the stomach and put your fingers into the skin folds. Turn them inwards to the last joints of your fingers. The audience will think your fingers have pierced the stocmach and gone right in. When the fingers are bent back, release the blood. With the left hand take a piece of cotton with the animal part inside. Push the cotton onto the folds of the stomach and act as if you are curing the part and taking it out. With fresh cotton clean the stomach of blood and show to the audience that the skin has healed itself psychically, and the person has been cured with the diseased portion removed.